The term ‘general lighting’ or ‘ambient lighting’ refers to the background levels of light in a particular space. In the majority of work spaces the minimum level of general lighting is determined in line with best practice guides to ensure safety and enable everyday visual tasks to be performed comfortably and efficiently. General lighting may be provided solely by artificial lighting or a combination of artificial and natural light. In such cases it is now becoming increasingly common to adjust the level of artificial lighting in line with the amount of natural daylight entering space to maintain minimum levels while reducing energy consumption. 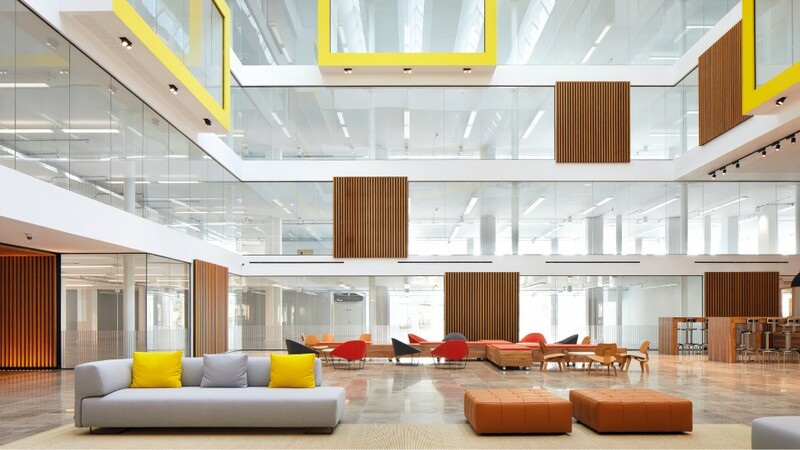 The introduction of new light sources such as LED has also enabled the colour temperature of artificial lighting to more closely resemble natural daylight, thereby creating a more natural feel to the lighting in the space. When combined with sophisticated control systems the colour of the general lighting can also be varied during the course of the day to more closely mimic natural daily and seasonal variation in daylight. In applications such as retail the general lighting provides a background against which accent lighting is used to highlight specific displays of merchandise. In such cases the interaction between general and accent lighting is essential in creating the right ambiance to support the shopping experience. In other work spaces the general lighting may be supplemented with task lighting to provide higher light levels or specific color rendering properties for specific tasks.